A stoneware water pot of squat globular form, supported on a short, splayedfoot. The sides taper towards the recessed double rim, and four loop handles are attached to the shoulder. The body is impressed with a net in the form of square diapers. 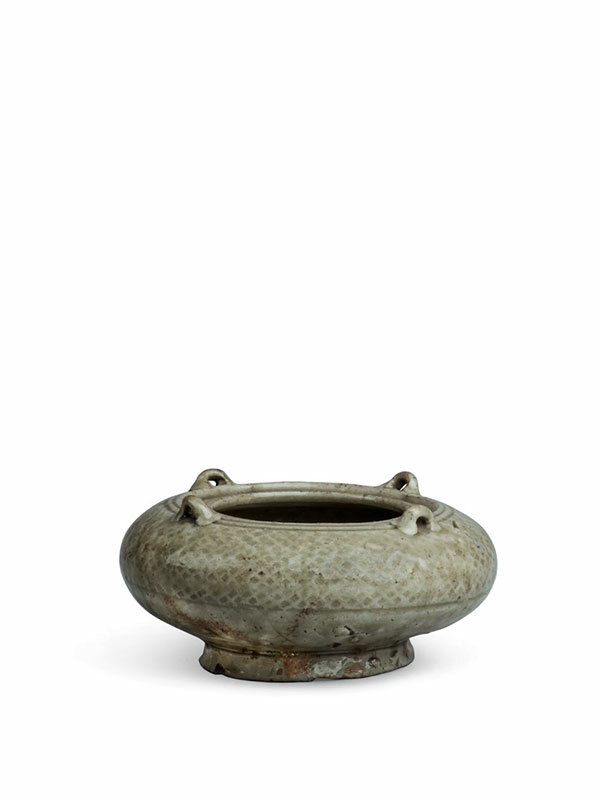 Both the interior and the exterior of the pot are entirely covered in a translucent greyish green glaze, which pools to a slightly darker tint in the recesses, leaving only the slightly concave base unglazed and revealing the orange stoneware body. The base has clusters of kiln grit adhering. A rectangular paper label reading “VIC/715 £33…” is attached to the base.